Welcome to the companion website for the roundtable presentation, “Using Genre Studies and Rhetorical Analysis to Evaluate Student Writing,” from the New England Modern Language Association Conference 2016. For more information about the roundtable, please visit the website of Heather Urbanski from Fitchburg State University who chaired this discussion. The practices of self-reflection, reassessing practices, and seeking further knowledge are fundamental ideas in the writing courses I teach—they also happen to be practices that I actively engage in both in and outside the classroom. It is for this reason that I have experimented with several different grading styles in my classrooms. After working with traditional grading (in-text comments, overall feedback, and numerical grades), grading contracts, and rubrics (all of which addressed my evaluation goals in various ways), the most effective evaluation strategy for my courses is through genre studies and rhetorical analysis. Before I focus on the actual process of evaluating student work through genre study and rhetorical analysis, it is important to consider my main goals in assessment. Transparency. Transparency is essential for creating a collaborative classroom. Evaluating work can often seem opaque. To alleviate this, I try to make terms of evaluation as clear as possible and to recognize that my view of a piece is not the only one that matters. De-Emphasizing Letter Grade. Because students often equate letter grades with the value of their work and ideas, de-emphasizing the grade as the ultimate goal in writing and assessment of quality is essential. Rather than focus on grades, the course is more about developing meaning writing projects. Valuing Student Voices. Not only do I try to focus on student writing, treating it the same way I would any other text, but I also value self-assessment from students. My goal is for students to feel empowered as writers despite grades, rather than because of them. Writing as a Process. This is clearly an important tenet in the contemporary writing classroom. While we emphasize drafts in the writing process, I try to carry this over to instructor comments by focusing on how the writer might revise to accomplish their goals. 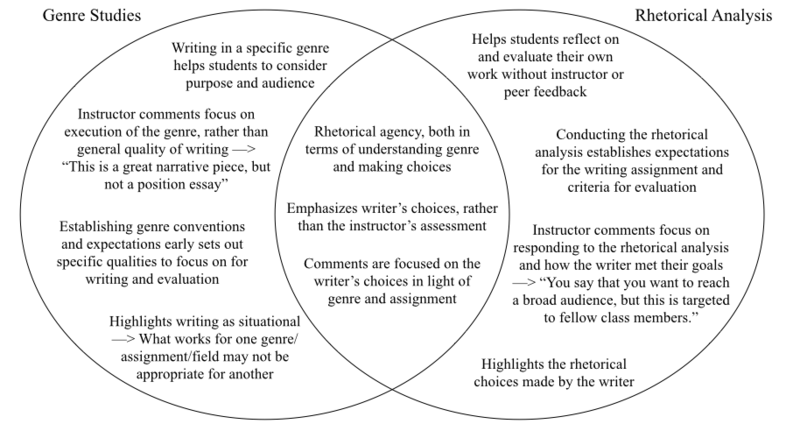 The diagram below highlights some of the major benefits I have found in using genre studies and rhetorical analysis in assignment design and evaluative feedback. As you can see, each has benefits on their own, but combined they encourage self-reflection and -evaluation in students and provide a solid platform for framing instructor feedback. By framing comments as responses to genre conventions and the rhetorical analysis of goals and choices and discussing the piece as an on-going writing project, genre studies and rhetorical analysis help to (1) make grading more transparent by focusing on a specific set of conventions, (2) emphasize the letter grade as situational for a specific type of genre, (3) give students a voice in the evaluation process and reflect on their work, and (4) focus on accomplishing writing goals over a series of drafts. Two major moments in the writing process jump out as important moments for self-reflection and possible placements for rhetorical analysis: before peer review and revision and following submission/completion. Placement 1: Incorporating the rhetorical reflection earlier in the process is helpful to guide students toward desired genre conventions and to forecast evaluation criteria. This gives students a chance to re-evaluate not only how they are completing the assignment, but what their goals are as a writer. Here, you are emphasizing writing as a process. I find this useful earlier in the semester when students are still coming to terms with the course, major concepts, and my evaluation practices. Most recently, I used this placement in a unit focused on literacy narratives. This was the first unit in WR 121: Research Writing at Emerson College. Before peer review, students wrote a short rhetorical analysis to reflect on their goals as writers and how they addressed genre conventions. Peer reviews focused on responding to those rhetorical analyses and offering suggestions to revise with writers’ goals in mind. In evaluating the revised drafts, I turned to the rhetorical analyses to assess how students approached the assignment and if they accomplished their personal goals. See the rhetorical analysis and peer review prompt here. Placement 2: As students become more advanced in making rhetorical choices, a rhetorical analysis after the fact can help to reinforce genre awareness and provide a way to position instructor comments as responses to student goals. This placement is often helpful for multimodal assignments or larger projects in which students may or may not accomplish their goals, but instructors want to emphasize the thought-process, rather than execution. I have used this placement in both WR 101 and WR 121 courses at Emerson College. WR 101 is a in-depth study of the essay as a genre. After an intensive unit focused on academic writing based on Kenneth Bruffee’s A Short Course in Writing, we began studying “experimental” or “hybrid” essays that did not follow academic forms of the genre. Students wrote experimental essays pulling from techniques we studied in class (translingual, personal, and mosaic essays) and a rhetorical analysis that explained the choices they made as writers. The rhetorical analysis provided the framework for my comments and the final grade. See the assignment prompt here. At the end of WR 121, students often participate in a showcase of student work. These pieces are usually interactive and multimodal. The assignment prompt is very open-ended and calls on students to make their own decisions about the project. On a traditional grading system, this might be problematic, but the accompanying rhetorical analysis, again, allows me to focus on how the students responded to the rhetorical situation and their thought-process in composing their piece. See the assignment and rhetorical reflection prompt here. Download a copy of the handout here.